The temperature plummeted to 3C and 2C on 2 consecutive mornings. We have been blessed with rain, plenty of rain and thunderstorms early in the season... ... hence drop in temperature. I was reluctant to get up and leave my warm comfy bed, but wake up I must... to prepare kids' lunch bags, to wake them up and get ready for school. H started preparing the chicken mix for wontons. .... but H has the tendency to double the amount of anything he is making... and we ended up with so much leftover of chicken mix. Mix all the ingredients in a bowl. Set aside. Start the steamer going on the stove. Washed and microwave the cabbage for about 1 minute or give it a quick blanch. Quickly soak in cold water to stop further cooking. Drip dry or pat dry the cabbage leaves. (chop off the hard stems, if there is any). Lay the leaf flat on a plate or clean chopping board with the hard stem near you. Spoon about 1 to 2 tablespoon of chicken mix onto the leaf. Roll with 1 turn and fold in the sides (left and right) and continue rolling. Place the rolled cabbage parcels with seam downwards on a steamer and steam for 20 minutes till the chicken mix is cooked. Garnish with golden fried chopped garlic and spring onion. Note : I moderated the quantities... feel free to add or reduce seasonings. Try to use the bigger leaves, as I encountered difficulties in rolling, due to smaller leaves towards the 'centre' or core. A wonderful recipe! I love Nappa cabbage and those flavors. Great summer food. These chicken parcels look so pretty and delicious. Great idea to use up leftover chicken mince. Love your photography. These chicken cabbage rolls look really pretty and delicious. You make everything look so good in camera Lisa! Sorry I have not been visiting you or any other bloggers lately. Was not feeling well for the past few months. Only you can make cabbage look 'pretty'! These look great! I don't eat chicken but will try them with minced tofu! Woohoo, stay warm. I usually like to have warm soup and some spice when the temperature dips. This dish definitely reminds me of cold fall/winter days. Such a comfort food and it's pretty light meal too. Your photos are simply gorgeous!! Love how light and lovely this roll looks and sounds! How cute are these bowls! Kat sini pulak semakin panas.. tapi lebih baik dari sejuk sebab kat sini winter memang harsh..
wong bok is one of my favorite steamboat veggies and to have meat in it sounds really yummyyyyy especially when it's cold! Delicious!!! Using cabbage also makes it all the more healthy! 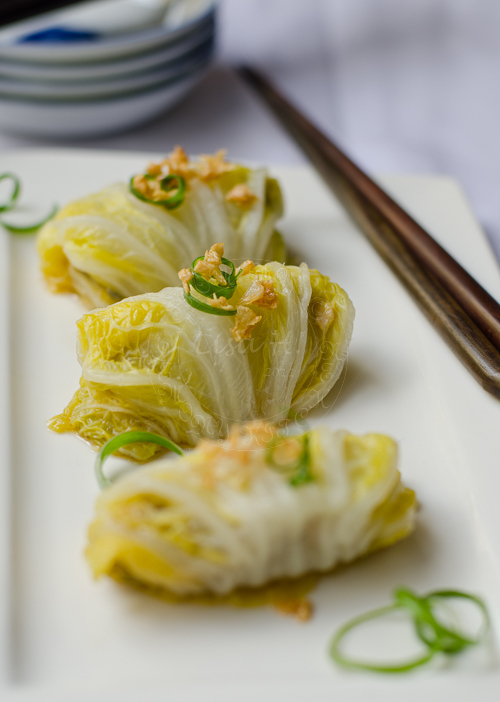 Is napa cabbage the same as savoy?